Posted by bessie on Monday, December 01, 2008. Today is an important day as almost 11,000 participants gather in Poznań, Poland to talk about climate change. The UN Climate Change Conference will go on through December 12th. These high-level talks are part of the ongoing negotiations to further enhance Kyoto Protocol agreements and to develop a post-Kyoto climate regime. The hope is that this conference will bring the participating nations one step closer to a formal agreement in December 2009. SustainUS, the US Youth Network for Sustainable Development, sent over a delegation of US-based student leaders who will be involved in the sustainable development policymaking process in Poland. Brighter Planet is honored to have donated 69,138 lbs. of carbon offsets to balance out the Agents of Change delegates’ travel emissions to and from the conference. This is an exciting opportunity for these youth to see climate policymaking in action. Offsetting the carbon emissions from their travel helps them to lead by example as they develop climate-responsible policy recommendations. 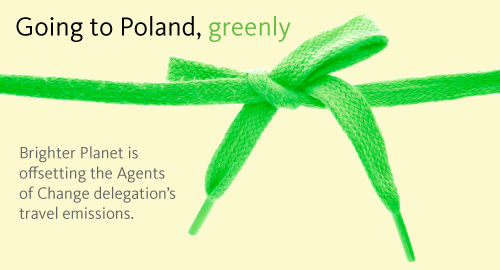 We’re looking forward to hearing how things go in Poland!